Menstruating Women Are Blocked From Indian Temple In Video Game — And In Real Life : Goats and Soda In Darshan Diversion, avatars of menstruating women dodge Hindu priests trying to bar them from a temple. Meanwhile, women of childbearing age can't enter India's Sabarimala temple — for real. 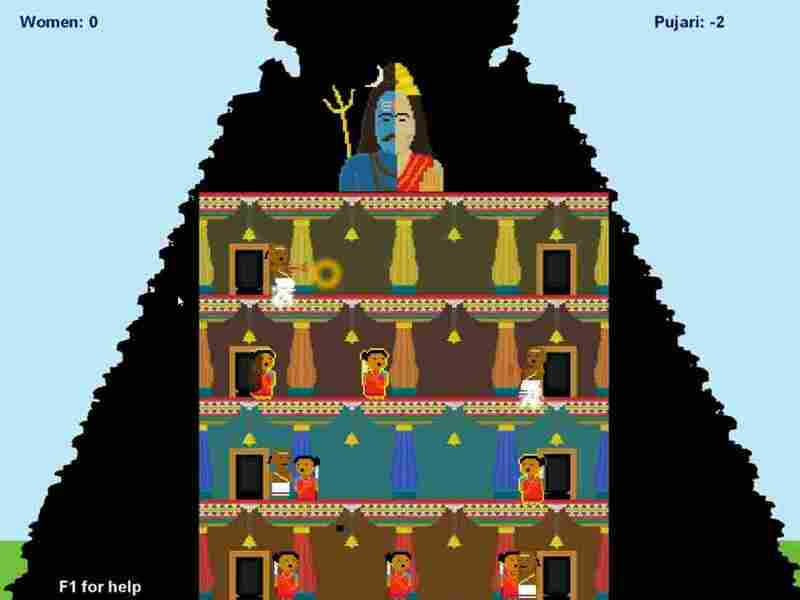 In the video game Darshan Diversion, avatars of women in red saris try to reach the top of a temple but are thwarted by Hindu priests if a red blinking light indicates that the women are menstruating. In September, India's Supreme Court ruled that blocking women between 10 and 50 from entering the temple is discrimination. But women who might be menstruating are still being refused at the door. Devotees have rallied nationwide against the court's order, and protesters have continued to keep women out. On Jan. 22, the Supreme Court will hear petitions from those opposed to its verdict. Murray, 41, says she got the idea for the game after reading a news article about Sabarimala. The then-president of the temple board had been quoted as saying women between 10 and 50 would be allowed into the temple only after someone invented a machine, like a scanner, to detect whether a female devotee was getting her period. "It was the absurdity of that [quote] that got me thinking that it's right for a video game," says Murray, a professor of digital humanities at the Srishti Institute of Art, Design and Technology, in the Indian city of Bengaluru. The result was Darshan Diversion, a two-player game where the participants can choose to be a priest or a woman. Darshan means "seeing god" in Hindi and several other Indian languages. The game is available for download on Windows devices. Murray recounts how people at the 2016 Global Game Jam hackathon were "slightly taken aback" when they first saw her game. The groups were given 48 hours to create a game on the theme of "ritual." "Many of the men [at the hackathon], were like, 'Whoa, it's a game about menstruation!'" she recalls. Menstruation is still a taboo in many parts of India. It's rooted in religion. Women and girls often aren't allowed to go to temples or take part in religious ceremonies on the days when they're getting their period. After September's Supreme Court verdict that ordered the temple to admit women of all ages, the Sabarimala controversy blew up into a national debate. People found Murray's game — and it went viral. Murray says she's not tracking how many times her game — still considered a prototype — has been downloaded. But it has garnered lots of attention. In October, it was featured at a women's festival in the Indian city of Bengaluru. A prominent Indian journalist tweeted about it. Local reporters picked it up and many news websites featured it. Jayashankar Panicker, 37, came across one such story. He's a devotee of Lord Ayyappa, lives in Kerala and has trekked to the Sabarimala temple several times. He says the game is an example of how some secular Indians give undue scrutiny to Hindu traditions rather than to those of other faiths. "Think about a game where a Muslim mullah [or clergyman] is being portrayed like this, stopping women from entering mosques. It would be a global outrage," he says. Sajitha Rani, 36, says she felt sad when she learned about the game. She's an activist with the Ready to Wait campaign — made up of women opposed to the Supreme Court verdict and who think they should not enter Sabarimala temple until they turn 50. "The people who are making video games like this have no idea what the Sabarimala shrine is about," Rani says. "They are portraying [Hindus] in a demonic manner and are trying to insult our culture." Murray says her intention was not to ridicule any religion or anyone's faith. Darshan Diversion was scheduled to be presented at another feminist festival in Mumbai in November, but Murray says organizers pulled it out of fear of a backlash. She says there's been a huge amount of trolling on Twitter, where users have suggested that game developers and the media focus their attention instead on scandals in the Catholic church and allegedly misogynist practices in Islam. Murray says she feels morally conflicted about whether her game should get more attention. She hasn't marketed it and has no plans to release an updated version. "I feel it's possibly a form of protest and I should be happy for it to be out in the public domain, but I also value my life," she says. She does think games like hers are part of a new trend in the gaming industry worldwide: Using games to advocate for social change. Unlike in real life, it's easy for menstruating women to reach the temple's summit and win the game. Murray says she rigged the game slightly in favor of the female avatars. "Women should be allowed into any space they want to be," says Murray. Sushmita Pathak is NPR's producer in Mumbai.